If you’re a fan of mobile gaming then you may be pleased to learn that Sega has today launched The House of the Dead: Overkill — The Lost Reels app for Android and iOS devices. The game is based on the popular Wii game from 2009 and now available on Google Play or at the App store for iPhone, iPad and iPod touch. This game was a cult console hit and developed by Magic Pockets and players will be part of the action with Agent G and Detective Washington. 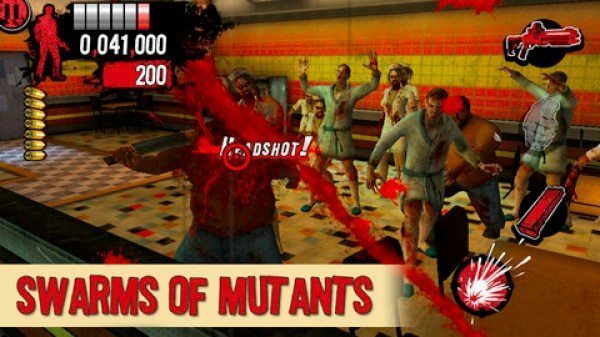 The arcade shooter game moves from Bayou City to Papa Caesar’s Mansion with players fighting in Story Mode or Survival Mode against a multitude of blood-thirsty mutants. The app game offers intuitive controls, accelerometer compatibility and also a Frenzy Tap that can be unlocked to make destroying mutants that bit easier. Please note that this is a high maturity game and so you should be over 17 years old to download it. The Android version of the app is available at Google Play here priced at $4.99 as House of the Dead Overkill: LR and compatible with devices running Android 2.3.3 or later. Meanwhile the iOS version, The House of the Dead: Overkill — The Lost Reels is available from iTunes here with a price of $6.49. It’s compatible with iPhone, iPod touch and iPad running iOS 5.1 or later and has been optimized for the iPhone 5. Are you racing to Google Play or the App Store to download this action shooter? If you’ve already played then why not let us have your comments and share what you think of the game with other readers.